Congratulations to English Department faculty members who have been awarded Fordham Faculty Fellowships! The English department is celebrating Professor Mary Erler's promotion to the rank of Distinguished Professor at Fordham University. Chair Glenn Hendler shared the good news with faculty and students at the 2015 Inaugural Lecture. Erler focuses on medieval and early modern literature, women’s reading and book ownership, and early English printing. She earned her BA in English at Saint Mary’s College in Notre Dame, Indiana and her MA and PhD in English from the University of Chicago. During her time at the University of Chicago, where she trained as a medievalist, Erler recognized a gap in scholarship on medieval women. Nowadays, names like Margery Kempe and Christine de Pizan abound in medieval scholarship. Erler’s contributions have no doubt propelled scholarly interest in the field. Along with numerous articles and reviews, Erler has written and edited several books, including the widely acclaimed Women, Reading, and Piety in Late Medieval England (2002). She has edited Robert Copland: Complete Poems (1993); Poems of Cupid, God of Love (1991) and the volume of Records of Early English Drama (REED) on Ecclesiastical London (2008) . She has also edited essay collections, including Gendering the Master Narrative: Women and Power in the Middle Ages (2003) and Women and Power in the Middle Ages (1988). These collections focus on the cultural position of women in medieval times. The latter has sold more than 5,000 copies, an impressive number for an academic volume, and is frequently used by professors in their courses. 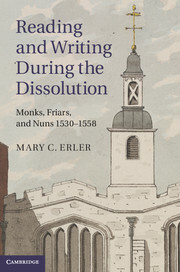 Most recently, Erler published Reading and Writing during the Dissolution: Monks, Nuns, and Friars 1530-1558 (2013). In this book, Erler shows how the chronicles, devotional texts, and letters of friars, anchorites, monks, and nuns reveal the various spiritual and practical responses to the changes in religious affairs during the Dissolution. “Bibliography can lead into biography,” Erler said. Erler has taught at Fordham for thirty-five years, offering courses to both undergraduate and graduate students. She described the experience of teaching as wonderful and merciful. “It gives you the opportunity to do over what you felt you didn’t do right the first time,” she said. Erler has also distinguished herself through her administrative duties. She was chair of Fordham’s English department in the 1990s, overseeing the merger of the Rose Hill and Lincoln Center campus communities. Erler asserted that, during difficult administrative times, history can inform future decisions. “We have the advantage of hindsight,” she said. Erler has also served on the faculty senate for ten years, and she has acted in various committees for both the English department and the larger Fordham community. Congratulations to Mary Erler on her well-earned accomplishment! A conference highlighting Fordham English Professor Mary C. Erler's internationally recognized contributions to the areas of medieval and early modern literature, women's reading and book ownership, and English printing was held on Saturday, March 7, at Fordham's Lincoln Center Campus. 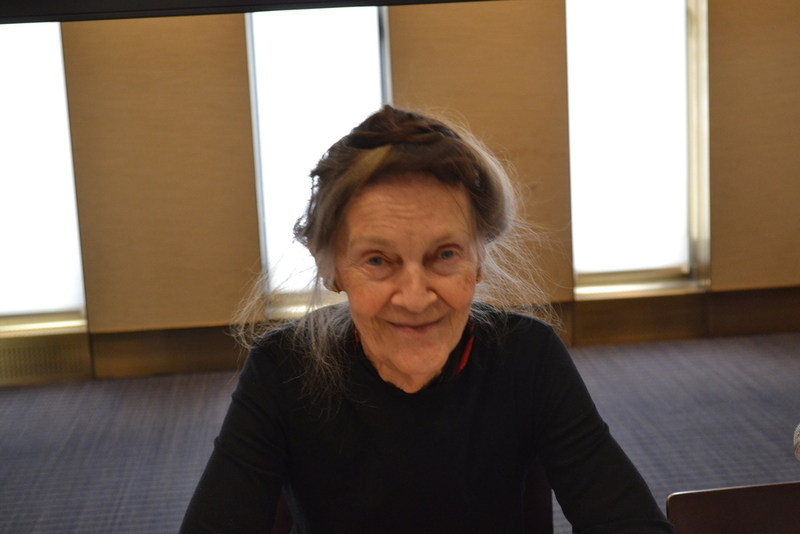 It was the 35th annual conference organized by Fordham's Center for Medieval Studies, and was titled Reading and Writing in City, Court, and Cloister: Conference in honor of Mary C. Erler. Speakers included Michael Sargent of CUNY Graduate Center, Joyce Coleman of the University of Oklahoma, Kathryn A. Smith of New York University, Caroline Barron of University of London, and Sheila Lindenbaum of Indiana University. The conference brought together friends and colleagues, some of them former students, who share Professor Erler's interests and whose own work has developed in dialogue with hers. Well over 100 scholars were in attendance, and even more came to the reception afterward to further honor her work. Professor Maryanne Kowaleski, Joseph Fitzpatrick S.J. Distinguished Professor of History and Medieval Studies at Fordham, introduced the event, and she has kindly allowed us to publish the text of her introduction, which also serves as a brief overview of Professor Erler’s illustrious career thus far. Welcome everyone! I’m so pleased to see such a large group to hear our stellar line-up of speakers. We gather today to honor the scholarly work and contributions made by Professor Mary Carpenter Erler, particularly to Fordham’s Center for Medieval Studies, a program which she has staunchly supported and advised over many years. Indeed, she has served on the Medieval Studies Executive Committee in three different decades, helped to organize two of our best-known conferences, and plays a key role in our publication efforts, both as a member of the Traditio editorial board and as the chief editor of the Fordham University Press Series in Medieval Studies. As the author or co-author of five books and almost forty articles, she is a scholar of international standing, especially known for her research on early printing and on women’s reading and book ownership. Mary arrived at Fordham in 1980 from the University of Chicago, where she did her PhD dissertation on early English printing, especially Robert Copland, printer, poet, translator, and employee of Wynkyn de Worde. In addition to editing Copland’s poems for the University of Toronto Press, Mary published several articles on his printing endeavors and authored his entry in the Dictionary of National Biography. Her work on early printing stimulated a long-term interest in Syon Abbey, a wealthy monastery of the Bridgettine Order which owned a noteworthy library and one of England’s earliest printing presses. I’m pleased that Michael Sargent can be here today to share his recent work on the interest shown by Syon nuns in Walter of Hilton’s contemplative work, the Scale of Perfection. Mary is particularly known for her path-breaking work on women’s reading and book ownership, producing two important monographs: Women, Reading and Piety in Late Medieval England (published by Cambridge university Press in 2002) and Reading and Writing during the Dissolution: Monks, Nuns and Friars 1530-1558 (also Cambridge, 2013). She argues for a common culture of vernacular piety between cloistered and lay women, evident in the devotional works they read, exchanged, and bequeathed to each other. Drawing on a wide range of sources along with codicological evidence, her work shows how books and reading played a crucial role in forming female networks, a perspective that Joyce Coleman will take up today in her paper on how female reading practices offer a new viewpoint on Chaucer’s Troilus and Criseyde. I also want to take this opportunity to thank Joyce for coming up with the conference title and for helping early on to focus our theme. Mary’s work on manuscripts and incunabula has always included a keen interest in images, particularly woodcuts, portraits, and manuscript illuminations, about which she has written several articles, including her contribution to The Social Life of Illumination, a book co-edited by Joyce Coleman and Kathryn Smith (with Markus Cruse). Mary’s extensive research on devotional literature also very much intersects with Kathryn’s interest in the roles of imagery in lay religion, which today she will discuss in the context of how the London-based artist of the Queen Mary Psalter creatively crafted his account of Christian salvation history. Kathryn’s paper is one of three today that focus on London, a reflection of Mary’s longtime interest in medieval and early modern London and her frequent archival trips there over the years. The three London papers also illustrate the interdisciplinary range of Mary’s work since they are given by an art historian (Kathryn), an historian (Caroline Barron), and a literary scholar (Sheila Lindenbaum). The interdisciplinary breadth of Mary’s scholarship is impressive, ranging from books of hours, early woodcuts and monastic libraries, to women’s reading, the impact of the Dissolution, Eucharistic controversy, Margery Kempe, the meditations of Nicholas Love, widows, and London theater, to name only a few of the themes which has written on. I have always been struck, in fact, how often Mary’s publications are read and even reviewed by historians, and have myself assigned several of her articles (particularly her piece on vowesses) in my graduate History classes. Her interdisciplinary inclinations are also evident in her collaboration with Thelma Fenster, a scholar of Old French and the French of England (whom I am very pleased to see here today), with me (an economic and social historian—we co-edited two essay collections on women and power), and with Caroline Barron, our foremost historian of medieval London. Mary and Caroline co-wrote an essay on the making of Syon’s altar table of Our Lady, and also together began a study of London’s chronicles which Caroline will revisit today in her paper on the distinctive form that chronicle writing took in late medieval London. Lastly we come to Mary’s significant work on medieval theatre, particularly her very valuable Records of Early English Drama (REED) volume, Ecclesiastical London, which contains the dramatic records produced by the cathedral, parishes and religious houses of medieval London. She first met our last speaker, Sheila Lindenbaum—who has probably known Mary longer than any of us—when they took the initial paleography course organized to train early contributors to the REED project. Inspired by Mary’s careful case studies of the relationships between medieval women readers and intellectuals such as learned confessors and ecclesiastical patrons, Sheila’s paper explores encounters between a wide variety of Londoners and learned academics to illuminate the civic elite’s interest in the liberal arts as well as the anti-intellectual sentiment evident among some urban artisans. She also brings us back to reading and writing as the central focus of this conference. I invite you, therefore to sit back and enjoy the rich array of scholarly offerings we have before us today that reflect the intellectual interests of Mary Erler and celebrate her many contributions to our understanding of medieval readers and writers. Tudor-era figure Thomas Cromwell, the hero of Hilary Mantel's historical novels Wolf Hall and Bring Up the Bodies, is now the center of two new Royal Shakespeare Company plays which opened recently in Stratford. The real-life friendship between Cromwell and an abbess during the English Reformation is explored in a recent History Today article by Fordham English Professor Mary Erler. The article is drawn from Professor Erler’s major new book Reading and Writing During the Dissolution: Monks, Friars, and Nuns (Cambridge University Press, 2013). To find out more about the book and stories related to it, like it on Facebook.